This week’s bento challenge is a ‘stars’ theme so I made two star shaped onigiri this morning. Unfortunately I topped it with furikake so you can’t even tell they’re stars, so I’m not going to submit this one. 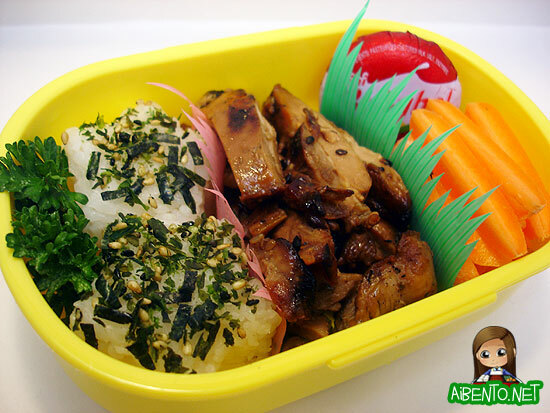 I’ll think of some other way to make a starry bento! My brother-in-law-to-be made us BBQ chicken last night and it was very yummy so I happily took some for my lunch today. We’d also had some stuffed chicken breasts from Costco but I didn’t take that since it has shiitake mushrooms in it. (I’m allergic to mushrooms, *sob*) That tasted pretty good too though, I’d tried a piece with no stuffing on it and surprisingly, it had very little fat and calories. I added some sliced baby carrots and a mini Babybel, which have grown on me quite a bit. I think the yellow ones taste better, but the reds are good too. 4 point lunch today with the rice and cheese, but I had only a 3 point day yesterday, so I can afford it!